Luke 21:37-22:6. And by day He was teaching in the temple, and at night He went out and abode in the mountain called Olivet. And all the people came early to Him in the temple to hear Him. Now the feast of unleavened bread drew near, which is called the Passover, and the chief priests and scribes sought how they might kill Him, for they feared the people. But Satan entered into Judas, surnamed Iscariot, who was of the number of the twelve, and He went and spoke to the chief priests and captains, how he might deliver Him to them. And they were glad, and covenanted to give him money, and he promised, and sought a fitting season when he could deliver Him to them without the multitude watching. The throng of the Jews, together with their ruler, stood up against the glory of Christ, and contended with the Lord of all. But anyone may perceive that it was against their own souls that they prepared their snare, for they dug for themselves pitfalls of destruction, and, as the Psalmist says, "The heathen are taken in the snare which they have made, in the trap which they have laid is their foot taken." For the Savior and Lord of all, though His right hand is almighty, and His power overthrows both corruption and death, yet submitted Himself of His own accord by becoming flesh to the tasting of death for the life of all, in order that He might make corruption cease, and do away with the sin of the world, and deliver those that were under the hand of the enemy from his unendurable tyranny. But that rebellious serpent perhaps imagined that He had prevailed even over Him, in that He suffered, as I said, death in the flesh for our sakes, as the dispensation required. But the wretched being was disappointed of his expectation. Let us then see how he missed his game, and shot wide of his mark, when he made Christ his prey, and delivered Him into the hands of those murderers. It says then, that "by day He taught in the temple, but lodged during the nights in the mountain called Olivet." Now plainly what He taught were things which surpass the legal service, for the time had come when the shadow must be changed into the reality. And they heard Him gladly; for oftentimes they had wondered at Him, "because His word was with authority." For He did not, like one of the holy prophets, or as the mystagogue Moses, call out to men, "These things says the Lord," but as Himself being He Who of old spoke by Moses and the prophets, and the Lord of all, He transferred with godlike authority to a spiritual worship what had been prefigured in types, and the weakness of the letter: "for the law made nothing perfect." And He lodged during the nights, as I said, on the Mount of Olives, avoiding the uproars there were in the city, that He might in this also be a pattern to us. For it is the duty of those who would lead a life quiet and calm, and, so to speak, full of rest, to avoid as far as possible the crowd and tumult. But let us see the course of the devil's malice, and what was the result of his crafty designs against Him. He had then implanted in the chiefs of the synagogue of the Jews envy against Christ, which proceeded even to murder. For always, so to speak, this malady tends to the guilt of murder. Such, at least, is the natural course of this vice: so it was with Cain and Abel; so plainly it was in the case of Joseph and his brethren; and therefore the divine Paul also very clearly makes these sins neighbors, so to speak, of one another, and akin, for he spoke of some as "full of envy, murder." They sought therefore to slay Jesus, at the instigation of Satan, who had implanted this wickedness in them, and who also was their captain in their wicked enterprises. For he is himself the inventor of murder, and the root of sin, and the fountain of all wickedness. And what was the contrivance of this many-headed serpent? 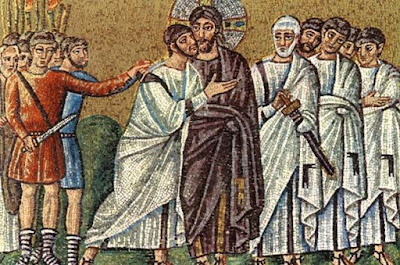 "He entered," it says, "into Judas Iscariot, who was one of the twelve." Why not rather into the blessed Peter, or into James, or John, or some other of the rest of the apostles, but into Judas Iscariot? What place did Satan find in him? Of all whom we have here mentioned he could approach none, because their heart was steadfast, and their love to Christ immoveable; but there was a place for him in the traitor. For the bitter malady of covetousness, which the blessed Paul says is "the root of all evil," had overpowered him. For once also when a woman had poured ointment upon the Savior, he alone of all rebuked her, saying, "To what purpose is this waste? For it could have been sold for much, and given to the poor." But the wise Evangelist rose, so to speak, against his feigned words: for immediately he adds: "But this he spoke, not because he had forethought for the poor, but because he was a thief, and carried the purse, and whatever fell therein, he was the bearer of." And Satan, being crafty in working evil, whenever he would gain possession of any man's soul, does not attack him by means of vice generally, but searches out rather that particular passion which has power over him, and by its means makes him his prey. 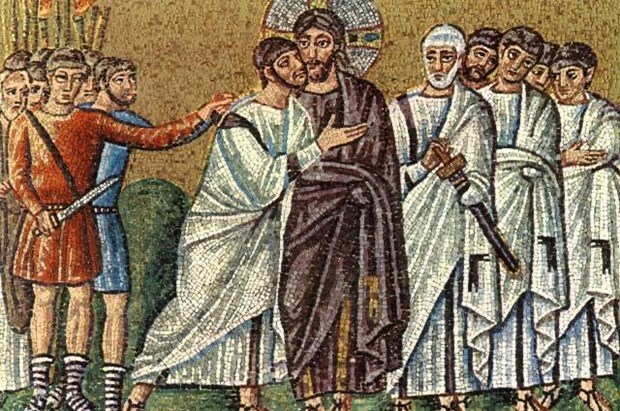 As he knew therefore that he was covetous, he leads him to the Pharisees and captains; and to them he promised that he would betray his teacher. And they purchase the treachery, or rather their own destruction, with sacred money. Oh! what tears could suffice, either for him who betrayed Jesus for hire, or for those who hired him, and purchased with consecrated money a guilty murder! What darkness had come upon the soul of him who received the bribe! For a little silver, he lost heaven; he missed the crown of immortality, and the desirable honor of the apostleship, and to be numbered among the twelve, to whom Christ somewhere said, "You are the light of the world." He cared not to be a light of the world. He forgot Christ, Who says, "You who have followed Me in My temptations, when the Son of man shall sit upon the throne of His glory, you also shall sit upon twelve thrones, and judge the twelve tribes of Israel." But he wanted not to reign with Christ. What a confusion too of error blinded the mind of that covetous man! He delivered to death Him Who is greater than death. Did you not know that Lazarus was raised on the fourth day from the grave, and that at His nod the widow's son also revived, and the daughter of the chief of the synagogue? Did you not hear Him say to the Jews concerning His body, "Destroy this temple, and in three days I will raise it up again?" Did you forget His words, "I am the resurrection and the life?" What therefore was the cause of such utter frenzy? The Evangelist tells us, where he says, "Satan entered into him," having obtained as his pathway and door the passion of avarice. And yet "the fear of God with a sufficiency is great gain," and, as the sacred Scripture says, "We neither brought anything into the world, nor can we carry anything out." And "those who seek to be rich, fall into numerous and unprofitable lusts, which sink men in pitfalls and destruction." And of this the disciple who became a traitor is a manifest proof: for he perished for the sake of a few wretched shekels. And what shall one say of those who hired him? That they fell into the very same pitfalls with him. Plainly they were the victims of a like intoxication, even though they had the reputation of being well acquainted with the law and the words of the holy prophets. It was their duty to have known the meaning of what had been spoken of old, as being before decreed by God concerning them. For among others are words like these, "My wrath is kindled against the shepherds, and I will visit the lambs." For the wicked shepherds perished miserably, while the calling of those who were obedient to salvation was a kind of visitation; for a remnant of Israel was saved. And, as if already, so to speak, they had fallen into ruin and destruction, and were wailing and weeping on this account, the prophet heard, he says, "the voice of shepherds wailing, because their might was brought low; the voice of lions roaring, because the pride of Jordan was spoiled." He calls the lions the pride of Jordan, by whom wore figured the chiefs of the Jewish synagogue, who, in just requital of their wickedness against Christ, wailed with their fathers and children, being consumed as with fire and sword, while the temple at Jerusalem was also burnt, and the cities throughout all Judaea abandoned to utter desolation. Such then was their fate, but Christ saves us by His merciful will; by Whom and with Whom, to God the Father, be praise and dominion, with the Holy Spirit, forever and ever. Amen.